Councillors on Wirral Council’s Environment Overview and Scrutiny Committee in a sensational 8:7 vote, voted in favour of a Conservative amendment proposed by Cllr Chris Blakeley to recommend that Cabinet withdraw its proposals for a Dog Control Public Space Protection Order. Earlier at the start of the meeting, in a discussion on moving the public meeting to the Civic Hall, the Chair Cllr Tony Jones had suggested ending the Council’s webcast for the rest of the meeting, yet had to smile when a dog interrupted him howling sadly at his suggestion. The proposal for a Dog Control Public Space Protection Order was consulted on last year and has attracted opposition from the public and two large five-figure petitions such as this online petition with at time of writing 18,047 signatures opposing it. The Cabinet Member for the Environment responsible at the time last year Councillor Matthew Patrick resigned as a councillor in October 2018. The new Cabinet Member for the Environment is Cllr Anita Leech. 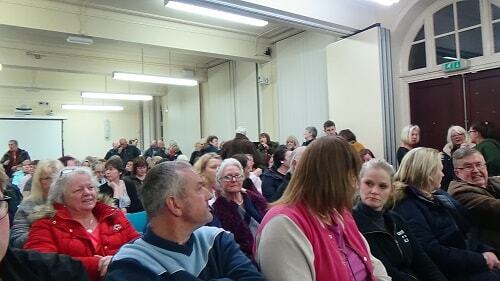 As you can see from the photo used above, both Committee Rooms 1 and 2 were full with people and it was standing room only as people wanted to see and hear what happened at the public meeting. Speaking at the meeting in favour of introducing the proposals was Wirral Council employee and dog owner Mike Cockburn (who also talked through a number of at times hard to read Powerpoint slides). Speaking against was Robert Wilkinson on behalf of a large number of people opposed to to the Dog Control PSPO. Video of the public meeting can be watched above, but the whole meeting contained a lot of dog-whistle politics. The decision made at the end of a long meeting was as follows (which is a recommendation to the ten Labour councillors on Wirral Council’s Cabinet). The first proposal of Labour councillor Cllr Brian Kenny (who is himself a former Cabinet Member for the Environment) seconded by Labour Cllr Tony Smith (who is a former Cabinet Member for Children and Family Services) is below. I’ll point out at this point that Cllr Brian Kenny is one of my three local councillors and another one of the three councillors for this area Cllr Liz Grey was also on the Committee even though it’s a rather tenuous interest. I’ve also included the amendment to that proposal too. This Environmental Overview and Scrutiny Committee having considered the public consultation exercise, agrees to ask the Cabinet to implement the final PSPO proposals for a 12 month period to be subject to a full review after 12 months. Committee requests that to date Council and its contractors have failed to use all existing legislation to deal with the issue of dog fouling and antisocial behaviour of the minority of dog owners. Committee believes that banning dogs from public recreation areas and open spaces is causing distress and upset to thousands of people across Wirral. Committee notes that the current proposals does nothing to tackle dog fouling in residential roads, shopping areas and outside schools but instead makes it easier for Kingdom and the Council to boost income through fines. Committee does not believe the Cabinet Member has taken into account concerns outlined in the consultation or has considered that this proposal will negatively impact on the Wirral visitor economy. Therefore the Committee asks Cabinet to withdraw these proposals and instead instruct Council officers to use its existing powers to their full extent, to deal with the minority of dog owners who act in an irresponsible manner. Against (7): Cllr Jean Stapleton (Labour, Birkenhead and Tranmere), Cllr Tony Smith (Labour, Upton), Cllr Brian Kenny (Labour, Bidston and St James), Cllr Sharon Jones (Labour, Leasowe and Moreton East), Cllr Liz Grey (Labour, Bidston and St James), Cllr Tony Cottier (Labour, Bebington), Cllr Tony Jones (Chair, Labour, New Brighton). The result of the vote attracted loud applause from the public present but it remains to be seen what Cabinet does next. « What did the public ask the 4 MPs on the House of Commons Transport Committee in Liverpool yesterday? Well done Socialist Jo Bird. You were the difference that gave us a release from the traditional, customary party political posturing and self-seeking DECEIT OF THE PUBLIC. PLEASE keep it going. All too often in the past we’ve had useless puppets like Tony Norbury collapsing prostrate and falling under the spell of hard right Labour Whip Ron Abbey. Which has translated to cuts, deeper austerity and the closing and demolition of disabled children’s schools. And thanks to you also John for providing a breakdown of the vote. We now need some more brave upsetters of the abusive apple cart in Seacombe, Liscard, Wallasey, et al, as Socialism and workers’ intetests are embraced and promoted. Well I know saying every vote matters sounds like a cliché but at this public meeting it did. As discussed as the meeting with around a quarter of Wirral households owning a dog (I’ll hazard a guess that that is slightly higher in the Labour voting areas) and there being elections in May, including areas that were close last time (a majority of 23 votes in Pensby/Thingwall for example) some people may wonder why it has taken to this point before it’s been recommended the proposals are dropped. After all there are probably thousands of voters in Pensby/Thingwall with dogs to name just one ward. Credit needs to be given those to the organisation and persistence of the campaign against the PSPO and groups such as Wirral Good Dogs, but this is just a step on the way to a Cabinet decision about it.